Posted in Accidents by Mikhail Voytenko on May 07, 2016 at 05:42. May 6: Dutch freighter NOVA CURA has been refloated after pumping out fuel and partial offloading, and taken to anchorage off Mantamados, Lesvos Island. It is understood, that offloading continues, vessel after offloading most probably, will be taken to ship repair yard. 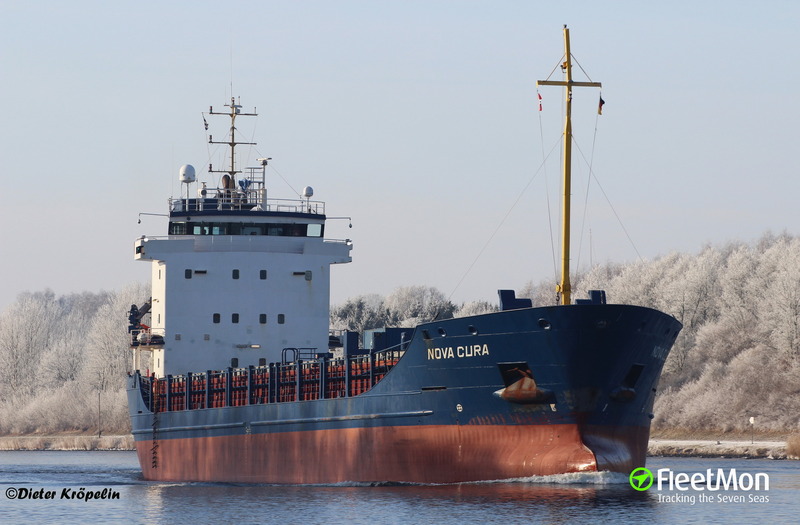 Dutch freighter NOVA CURA ran aground on reefs north of Lesbos island, Greece, Aegean sea, in the morning Apr 20, while en route from Istanbul to Aliaga, Turkey, with cargo of steel pipes. Vessel suffered a breach starboard underwater, with controlled water ingress. FRONTEX ships were deployed in assisting vessel, that’s why there were rumors in local media about possible illegal migrants on board. As of 0530 UTC Apr 21 vessel was still aground.